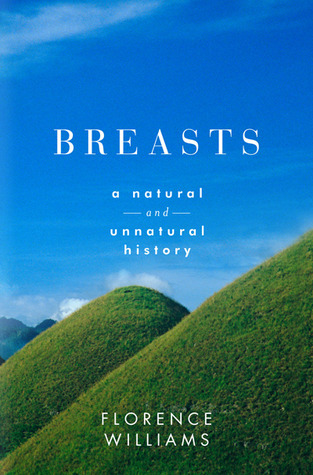 Today I bring you a most interesting book “BREASTS: A Natural and Unnatural History” by Florence Williams. I agree with Miss Williams when she says in as much as breasts stare us in the face, we actually don’t know that much about them. Did you know that breast milk contains substances similar to cannabis? Or that it ‘s sold on the Internet for 262 times the price of oil? Feted and fetishized, the breast is an evolutionary masterpiece. But in the modern world, the breast is changing. Breasts are getting bigger, arriving earlier, and attracting newfangled chemicals. Increasingly, the odds are stacked against us in the struggle with breast cancer, even among men. What makes breasts so mercurial and so vulnerable? In this informative and highly entertaining account, intrepid science reporter Florence Williams sets out to uncover the latest scientific findings from the fields of anthropology, biology, and medicine. Her investigation follows the life cycle of the breast from puberty to pregnancy to menopause, taking her from a plastic surgeon ‘s office where she learns about the importance of cup size in Texas to the laboratory where she discovers the presence of environmental toxins in her own breast milk. The result is a fascinating exploration of where breasts came from, where they have ended up, and what we can do to save them. This entry was posted on July 10, 2012 by Paulina Constancia in Uncategorized.